We've lived in this apartment for 20 years and we've gone through at least 9 apartment managers that I can remember. About 15 years ago we were friends with the manager we had and she asked me to take some pictures for her and email to her since she didn't have a phone or a camera. The camera I had was a POS and didn't have a flash so the pictures aren't great but they do tell a story. The manager evicted this couple and their 4 kids because people were complaining about the fights, the noise, the cops always being at their apartment and about people constantly knocking on their door all hours of the day and night...staying for 10 seconds and leaving. We suspected they were dealing drugs. So they got evicted, left a huge mess, damage and then fought the eviction in court and wanted their security deposit back. So she used these pictures to show the judge why she refused to give them back their security deposit. 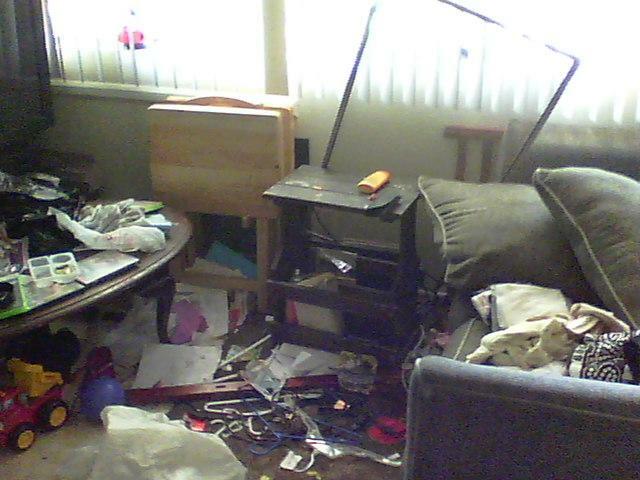 This is the room where all 4 kids slept and it was a mess. There were bunk beds and a crib in this room. There was a newborn, a 1 year old, 3 year old and a 5 year old. 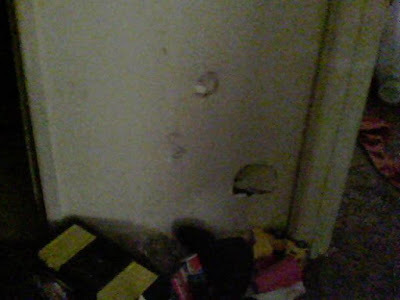 The front door had been kicked in a few times so the door was broken in several places. Most of the walls had holes in them. This looked like someone had kicked it a few times. 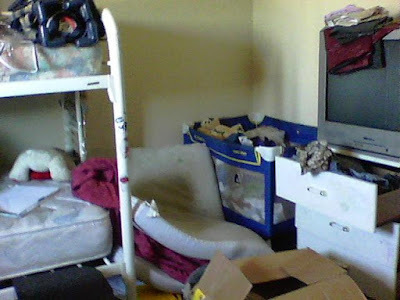 There was so much stuff packed into the kids bedroom, there was hardly any room to walk around. But the worst thing we found was the lock on the outside of the bedroom door. The manager said she was going to point that out to the judge. I don't know if he sent children's protective services to their new place or not though. I can only hope so. About 2 weeks later they came and packed their stuff up and left with it. They wanted their security deposit back? From the movie 'The Castle' tell them they are dreaming. And I hope that protective services WERE involved. Yeah they were not thinking clearly at all. Horrible, but I guess fairly common. When I watch those flip show on HGTV, houses always look like this. I guess they came back and got their crap after finding a new place to destroy? Yeah they came and got their crap. They were nuts if they thought they should get any money back. Pffft. Hopefully child services went after their arse. I really hope an investigation was had. Hopefully something was done about the kids. They shouldn't have been living in such conditions. I have no idea but I hope so. Some humans shouldn't be allow to be parents. Those poor kids. Not just the mess but the whole situation. Makes you wonder how their lives turned out. I'm not surprised they didn't get their deposit back! I feel sorry for the children since they don't have a say in how they live. I can remember having a discussion with a friend who worked with social services and she said that one of the things they check in homes is whether there are sheets on the mattresses. It's one of the markers of a less than ideal situation for children. Strangely, that's the thing that stands out most to me here. I agree. That's a good indication of whether the parents are taking care of them. 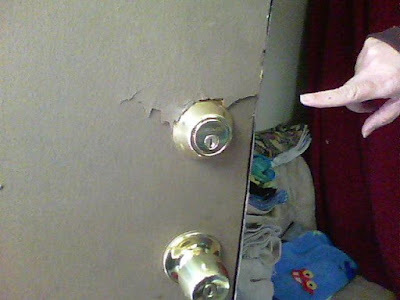 I accidentally dented some drywall today (pushed the door too hard as I entered and the tip of the lock made a dent), but those with holes over the house have some severe anger issues. Little dings I can understand. But huge holes all over, you're right...anger issues. I feel really bad for those kids. 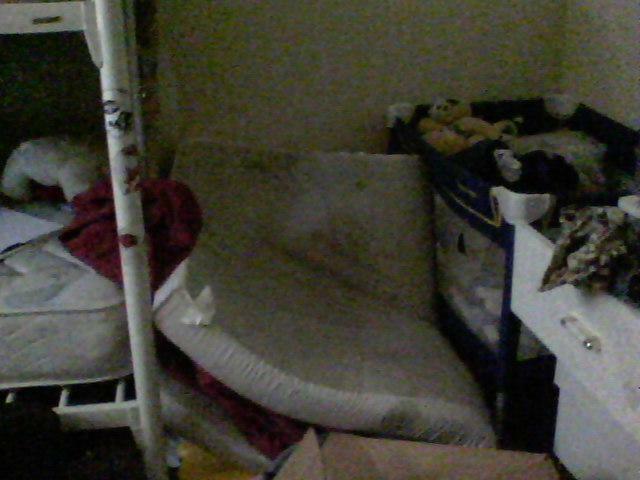 That's not a safe living environment, and their bedroom needs a lot more room. What if that one mattress had flipped on top of the crib? I really hope they've found a better living situation by now. It was 15 years ago so I am hopeful. I know. It's so crazy. Ohh, how sad. What a life for the poor kids. I am always so angry when I learn about mistreatment of children. Glad you took the photos and I hope they were used against those shitbag people. She said she did show them to the judge but I don't know what he did. Some people are unfit to be parents. I feel so sorry for those kids. I hope CPS was called. Living in an apartment can be a crazy experience. 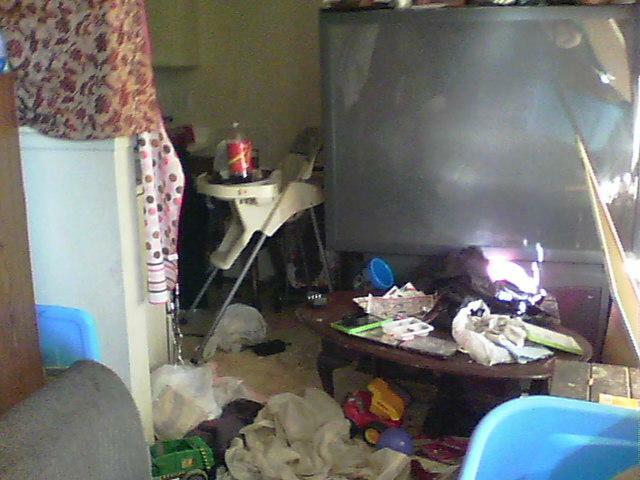 So sad that the kids were living like this. I hope that Child Protective Services looked into it. 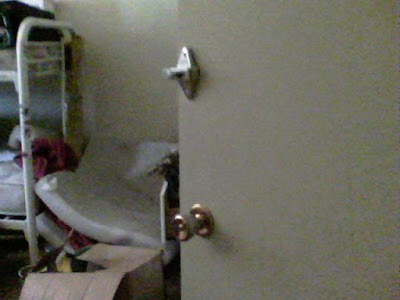 The lock on the outside of the door is really scary. Imagine if there was a fire and what that could do to a child's mental state. I really hate people. Neither one of us could believe that lock on the outside of the door. The whole apartment was insane. Hopefully something was done about the children.